Rating: 4.9/5 based on 19 review(s). 2231 people have bought this item! Pallet Rates are also available on this item, please contact us for more information. If you are working on site, by a roadside or need an area cordoned off then your best solution will probably be a barrier system. There are many sizes, weights, colours suitable for a variety of different applications. Below is a list of our best selling barrier systems. If you need any advice or more information regarding them please just contact us and we can hopefully guide you in the right direction. These come in either yellow, blue or red systems and come standard with top reflective panels but can be manufactured with black vertical panels depending upon the requirements. They fold up quickly and easily and are extremely lightweight making it perfect for quick distribution and packing up. Also each panel has integral location holes to accept white foamex courtesy / warning signs. They are made entirely from plastic materials, they are non-sparking and also non-conductive. Their unique linking system design creates secure joints even on uneven ground, over kerbs, up slopes and even across rough terrain. Their unlocked or locked mode configurations prevents unauthorised dismantling and the design complies with BS 7818 Specification for pedestrian restraint systems making it ideal for event management and pedestrian control usage. Advertising signage and reflectives can be fixed to front and back and they are also suited to construction applications around temporary excavations and road works. They can be used with link boards to extend barrier configurations and can accept warning signs and contractor information boards. They are blow moulded 1 piece barrier constructed from tough high density polythene. Available in 2 metre length and their weight is 10kg and are available in blue or orange (Blue made to order, min quantities apply). Finally they are designed for secure stacking and easy transportation. The TITAN is the recognised and well established stacking barrier from JSP. It has all the usual advantages of standard stackable systems but in addition has many unique features.The TITAN is an easy to use, assemble and store barrier system and is available in 2 metre or 1.5 metre lengths. Dual colour coded systems for contractors' corporate I.D. 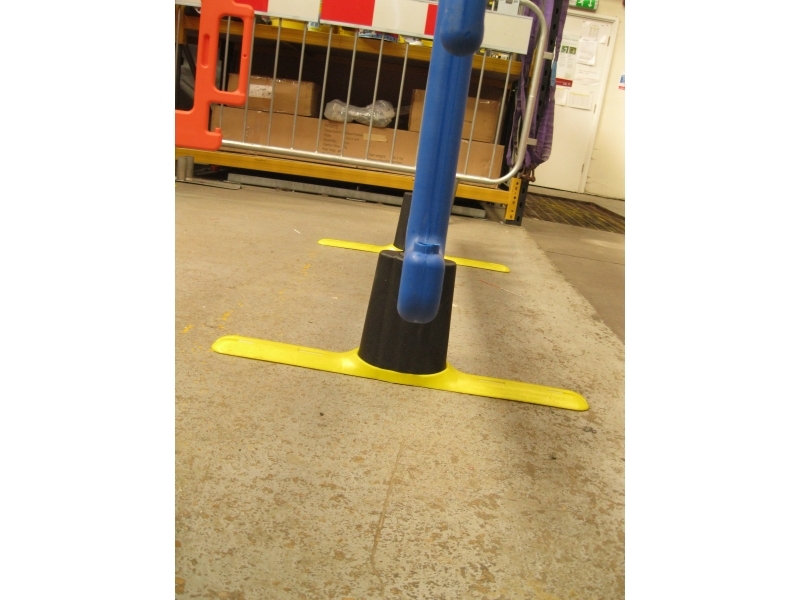 This barrier system is suitable for use around ground works, cable laying and any other small scale works. It can be used to prevent access to areas of wet floor, or cordon off trip hazards and spillages. Its compact design makes it ideal for use in workshops and even supermarkets. Compact and lightweight the Safegate Barrier System is one of the easiest barriers to deploy and is supplied with three or four Chapter 8 compliant, reflective Gates, and all the necessary clips to use the gates. The size of the gates are 1000mm tall and 750mm wide. Very quick delivery, good quality perfect for the job it was purchased for. Goods arrived on time and free of charge. Very easy to deal with. Brilliant range and great delivery service. Everything is very clear on the website so you know exactly what your buying and at what price. Fab! My order arrived the following day as promised without any issues. Happy chappie. Great service by friendly staff. Would use again. It is very useful, a good barrier at good price. We ordered 6 barriers with anti-trip feet from Sitebox online and they duly arrived on site the following day, not sure why they are more expensive to have anti-trip feet as Im sure they cost no more to manufacture but there you go. Ordered 10 online and got delivery next morning, cant ask for much more really!